With exam season just around the corner, it’s never too early to start revising key topics and exam technique. Whether your students are puzzled by poetry or struggling with Shakespeare, ensure that they feel as prepared as possible this summer with these innovative ideas, selected from our GCSE English collection. What are you waiting for? An excellent teaching and revision guide for AQA's Power and Conflict cluster. All on two sides of A3. Contains everything students need to know on all fifteen poems, plus sections on themes, language for comparison and poetic techniques. A must have for teachers and students. Blood Brothers Knowledge Organiser/ Revision Mat! Key words and ideas are underlined for easy reference. The resource is designed to be printed onto A3, and is provided as both a PDF and a Word version (so that you can edit if you want to). All images used are licensed for commercial use and are cited on a separate document (included). 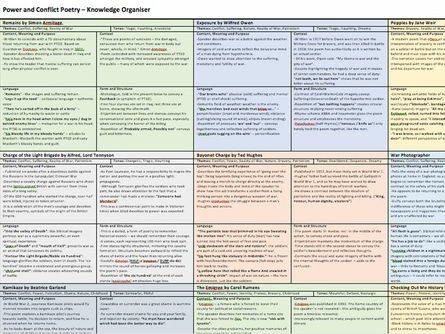 This is a detailed A3 revision grid that has information on all 15 poems from the love and relationship cluster for AQA. It includes points on the theme of love/relationships, five key quotes for each poem, comments on the form/structure and points on context for each one. Use this as a revision tool so that students have a secure understanding on the main ideas linked to each one. And the Power and Conflict knowledge organisers make comparisons and links between different poems. A brilliant revision tool for students, teachers and parents. 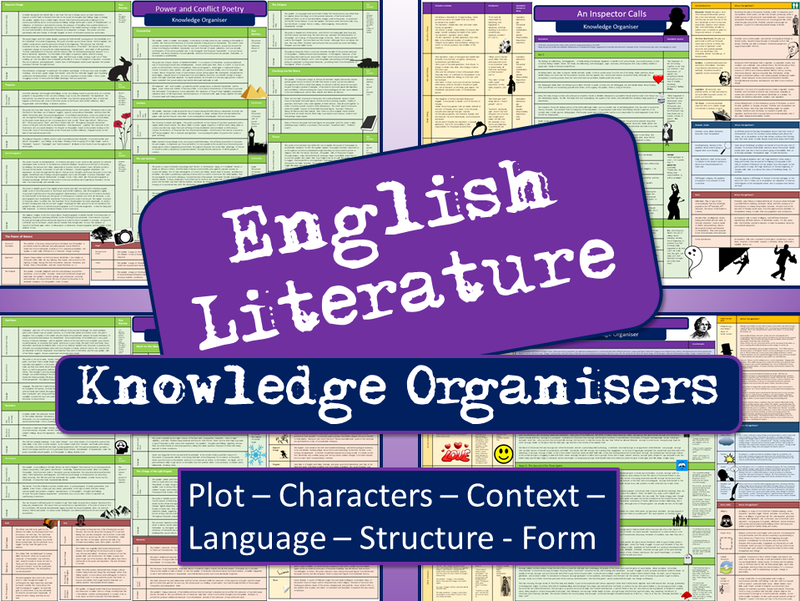 These knowledge organisers or revision mats include everything you need to help you revise for the AQA English Literature Exams (Both Paper 1 and Paper 2). This activity takes a wee while to set up but it is really worth it and can be used year on year from then on. It is a revision board game to help consolidate information from the drama 'An Inspector Calls'. The board itself was made up by me, however the questions were made up by my students so check them for accuracy before printing. Alternatively, you could (as I did) get the students to come up with their own questions which, although a lengthier process, does give the students even further revision opportunities. I also used a 'revision dice' in mine that I found on this TES revision website, however it is not essential for the game to run. A PowerPoint and 'How to Play' worksheet indicating how the game is played. The nature of the game ensures that this resource can challenge students of all levels. NOTE: You can buy this resource alone, or in a bundle of 8 Pointless games, for only £1 more! This is a game that can be played in a variety of ways. I get them to roll the die, answer the questions and then move. Whoever gets the furthest wins. It is adaptable. Inspired by an AIC game I found on Teach English on Twitter and adapted for other topics. A trivia style game that asks questions on plot, terminology, characters, themes, and significant quotes. My students loved this and it can be adapted to include more or different questions if needed. This superb resource contains THIRTY sample exam questions for revising THEMES (12), CHARACTERS (12) and TECHNIQUES (6) of ‘An Inspector Calls’. 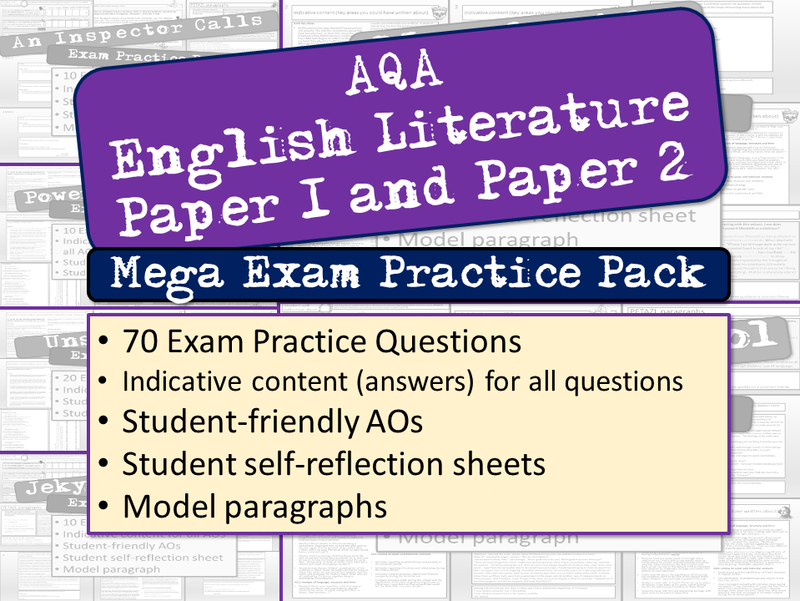 These questions have been carefully designed to reflect the exact format and demands of the AQA GCSE English Literature exam paper. Also included is concise information on the AOs and a student-friendly version of the Mark Scheme. These exam questions can be used both as class activities and as homework. They are also ideal for practice tests in the run-up to the exams. I hope these are helpful for you and instructive for your students – as always, I’d be delighted to hear any feedback you may have. I will be adding lots more GCSE revision resources to my shop so please check back regularly! A collection of 15 questions designed to reflect the new AQA GCSE extract questions for Shakespeare's Macbeth (Literature Paper 1 Section A). AND each pack contains answers (or indicative content) for EVERY single question. Other authors on TES just give you the essay titles, but this has got all the answers, too! Brilliant for practising and self-reflecting on your essay skills before the big exams. Moreover, each pack contains student-friendly AOs so students understand exactly what they’re being marked on, self-reflection sheets for peer and self assessment, model paragraphs for scaffolding and modelling and more. A revision resource for GCSE students to help them memorise key quotations from Macbeth. A 5 page document, colour-coded according to character. Accompanying brief analysis of each quotation: stylistic features, key themes, similar scenes. Students to match up unfamiliar words before reading Jekyll and Hyde so that they can feel more confident when they are reading the older text. Answers included. PowerPoint for an exam walk-through looking at the AQA Question from May 2017. Differentiated starter: define the key words linked to male aggression and make links. Main: Analyse 5 key extracts that demonstrate male aggression with a focus on A01 and A02. Suggested answers are on the PowerPoint to guide students through each extract. Plenary: Draw a line graph to chart the intensity of male aggression across the play. Each guide is structured into sections of: Initial Impression, Development/Nuances, Final Impression, Relationship / Interaction with Other Characters, Audience Reaction, Structural/Dramatic Significance (e.g. how the character relates to structure and form in the play) and Purpose. This structuring makes it easy for students to access higher level analysis in relation to the assessment objectives and themes of the play, encouraging them to develop their perspective of the character. There is a quote section at the bottom and key quotes in speech bubbles along the side. There is a character summary box at the top. 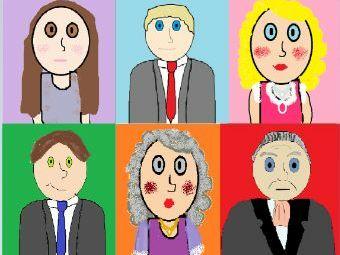 The aim of this resource is to provide easy revision that is tailored to the kind of questions that will come up in the exam, as it is structured to show the presentation and development of each character, their purpose in the play, relationship with other characters and how they relate to the structure and form of the play. The quote section will also help students in closed book exams as they are all carefully selected to be applicable to a wide range of topics. The purpose section will be useful for students aiming for higher grades. I have also included an exemplar (grade 9) essay for Sheila, Mr Birling and Eva (within the theme of poverty), and an essay plan for the Inspector.